International Journal of Research in Health Sciences,2014,2,3,767-775. 1-Associate Professor, 2-Assistant Professor, 3-Post graduate, Upgraded department of Pathology, Osmania Medical college/ Osmania general hospital, Hyderabad, Telangana, INDIA. Aim: The study was undertaken to establish mammaglobin as a marker to differentiate between benign and malignant breast lesions. Materials and methods: The present study was undertaken at Osmania general hospital, Hyderabad from January 2012 to July 2013. A total of 60 samples of various breast lesions were studied. 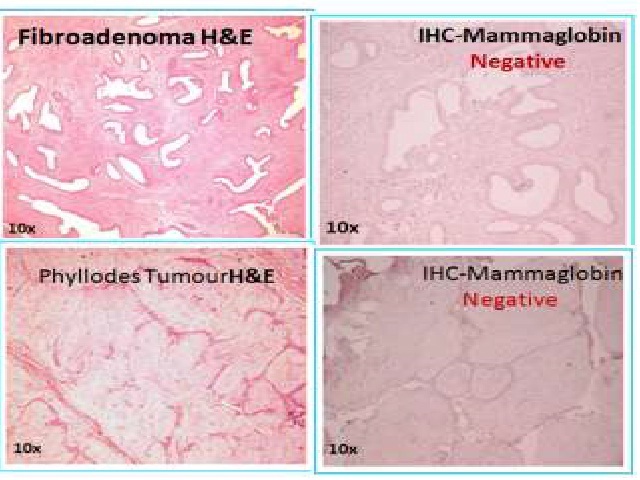 Immunohistochemistry was performed by using mammaglobin antibody. Results: Mammaglobin immunoexpression was seen in 75% cases of breast carcinoma. The invasive ductal carcinoma-NOS type showed stronger and diffuse staining pattern than other variants of breast carcinoma. Interestingly high mammaglobin expression observed in low grade tumours compared to high grade. Conclusion: Mammaglobin is over expressed in malignant breast lesions compared to non-neoplastic lesions of breast (P<0.05). The expression is high in low grade tumours compared to high grade tumours.